Jewish Vegetarian - Vegan Articles that discuss ways of living in peace with humans, animals, and the environment. Passover and vegetarianism? Can the two be related? After all, what is a seder without gefilte fish, chicken soup, chopped liver, chicken, and other meats? And what about the shankbone to commemorate the paschal sacrifice. And doesn't Jewish law mandate that Jews eat meat to rejoice on Passover and other Jewish festivals? An increasing number of Jews are turning to vegetarianism and they are finding ways to celebrate vegetarian Passovers while being consistent with Jewish teachings. For many years, Jonathan Wolf, a Jewish vegetarian activist, has had up to 50 people at his Manhattan apartment for completely vegetarian seders. Each year the number of vegetarian seders increases. Contrary to a common perception, Jews are not required to eat meat at the Passover seder or any other time. According to the Talmud (Pesachim 109a), since the destruction of the Temple in Jerusalem, Jews need not eat meat to celebrate Jewish festivals. In recent scholarly articles by Rabbi Albert Cohen in the Journal of Halacha and Contemporary Society and Rabbi J. David Bleich in Tradition magazine, this concept is reinforced. Also, Israeli chief rabbis, including Rabbi Shlomo Goren, former Ashkenazic Chief Rabbi of Israel and Rabbi Sha'ar Yashuv Cohen, Ashkenazi Chief Rabbi of Haifa, were or are strict vegetarians. 1. At the seder, Jews say, "Let all who are hungry come and eat". As on other occasions, at the conclusion of the meal, bircat hamazone is recited to thank God for providing food for the world's people. This seems inconsistent with the consumption of animal-centered diets which involves the feeding of 70% of the grain grown in the United States and almost 40% of the grain grown worldwide to animals destined for slaughter while an estimated 20 million of the world's people die of hunger and its effects annually. Although he is not a vegetarian, Rabbi Jay Marcus, Spiritual Leader of the Young Israel of Staten Island, saw a connection between simpler diets and helping hungry people. He commented on the fact that "karpas" (eating of greens) comes immediately before "yahatz" (the breaking of the middle matzah for later use as the "afikomen" (desert) in the seder service. He concluded that those who live on simpler foods (greens, for example) will more readily divide their possessions and share with others. Many Jewish vegetarians see connections between the oppression that their ancestors suffered and the current plight of the billions of people who presently lack sufficient food and other essential resources. Vegetarian diets require far less land, water, gasoline, pesticides, fertilizer, and other resources, and thus enable the better sharing of God's abundant resources, which can help reduce global hunger and poverty. 2. The main Passover theme is freedom. While relating the story of our ancestors' slavery in Egypt and their redemption through God's power and beneficence, many Jewish vegetarians also consider the "slavery" of animals on modern "factory farms". Contrary to Jewish teachings of "tsa'ar ba'alei chayim" (the Torah mandate not to cause unnecessary "pain to a living creature"), animals are raised for food today under cruel conditions in crowded confined spaces, where they are denied fresh air, sunlight, a chance to exercise, and the fulfillment of their natural instincts. In this connection, it is significant to consider that according to the Jewish tradition, Moses, Judaism's greatest leader, teacher, and prophet, was chosen to lead the Israelites out of Egypt because as a shepherd he showed great compassion to a lamb (Exodus Rabbah 2:2). 4. Passover is the holiday of springtime, a time of nature's renewal. It also commemorates God's supremacy over the forces of nature. In contrast, modern intensive livestock agriculture and animal-centered diets have many negative effects on the environment, including air and water pollution, soil erosion and depletion, the destruction of tropical rain forests and other habitats, and contributions to global warming. 1. 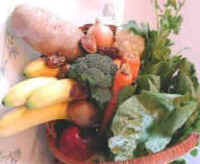 The Jewish Vegetarians of North America; 6938 Reliance Road, Federalsburg, Maryland 21632; (410) 754-5550. 2. The International Jewish Vegetarian Society; 855 Finchley Road, London NW 11, England. 3. Micah Publications; the source for books on Judaism and vegetarianism and related issues; 255 Humphrey Street, Marblehead, Massachusetts 01945; [email protected] or [email protected] book.com WWW.micah books.com. They have published vegetarian-friendly haggadahs, "Haggadah for the Liberated Lamb" and "Haggadah for the Vegetarian Family", both by Roberta Kalechofsky, founder and director of Jews for Animal Rights (JAR) and Micah Publications, which contains traditional and new material for a vegetarian seder, including recipes, songs, notes, readings, and a bibliography, and "The Jewish Vegetarian Year Cookbook" by Roberta Kalechofsky and Rosa Rasiel, which includes many recipes suitable for Passover. They also have a video cassette that describes a vegetarian seder. Other books that have vegetarian recipes appropriate for Passover include "No Cholesterol Passover Recipes" by Debra Wasserman and Charles Stahler (Vegetarian Resource Group, P. O. Box 1463, Baltimore, MD 21203) and "Jewish Vegetarian Cooking" (the official cookbook of the International Jewish Vegetarian Society) by Rose Friedman (Thorsons Publishers). Author of Judaism and Vegetarianism, Judaism and Global Survival, and Mathematics and Global Survival. Patron of the International Jewish Vegetarian Society.